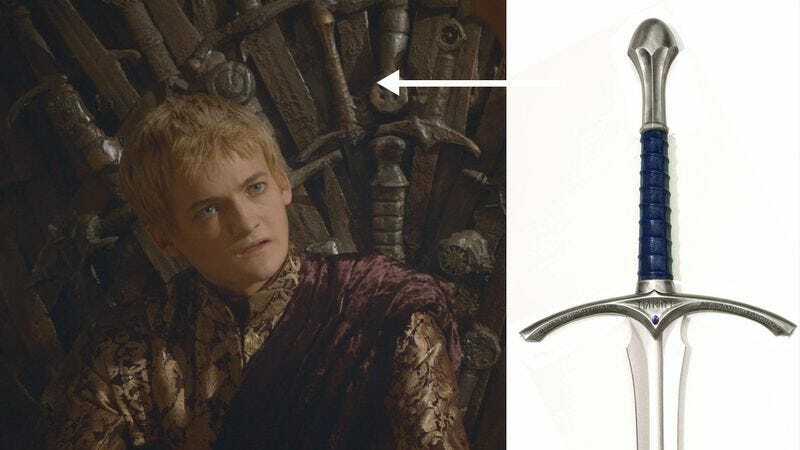 In a development that should immediately prompt an Internet-wide effort to reconcile the canons of the Lord Of The Rings trilogy and the Song Of Ice And Fire series, an astute Reddit user has discovered Gandalf’s sword in the Game Of Thrones TV show’s Iron Throne. The Redditor, who goes by the handle NoMoreHodoring, posted a convincing side-by-side photo that shows a weathered version of Gandalf’s sword (as seen in the Peter Jackson movies) almost centered on the show’s iconic seat of power. Further down in the Reddit comment thread, other users note that a sword just to the right of Gandalf’s blade bears a strong resemblance to a sword sold online as Robin Hood’s sword. This revelation could complicate the show’s mythology even further. Or we could just assume that when the Game Of Thrones set designers needed to create a chair made from a bunch of swords, they went out and bought a bunch of swords. So, who wants to start the Rings/Thrones/Robin Hood wiki?